With 2014 marking the 40th anniversary of the Health and Safety at Work Act, Jo Carter considers the history and evolution of height safety. Falls from height are one of the biggest causes of death and serious injury at work1. The 1961 Regulations remained the standard for more than 30 years. 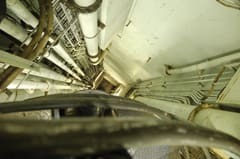 Although focussing narrowly on hardware issues such as scaffolding and associated hazards rather than systems for safe design or managing risks, at the time they were believed to be a significant step forward. Their impact on improving the industry’s woeful safety performance, however, proved disappointing. That year 23,356 accidents were reported on building and civil engineering sites, an increase of 10% from the previous year.7 Of those, 264 were fatal. By 1974, annual fatalities had dropped to 166, but reported accidents had increased to 34,598. Steve Cannon of the Registered Digital Institute (RDI)11 well remembers how unsafe industry used to be, from his experience in the signal reception and installation industries. The ethos from many organisations was ‘work safely’ - while at the same time equipping workers with only a mains powered hammer drill and a mains extension cable, with no residual-current device (RCD) or earth leakage circuit breaker ELCB) to work outside in the pouring rain. If any questions of safety were asked, a common response in Steve’s experience was that workers should use a plastic bag to cover the drill so that it didn’t get wet. PPE was just another three-letter acronym that often didn’t mean a great deal to installers or organisations. Basically anything was possible: installers could gracefully skip over the wet roof tiles in plimsolls while being simultaneously battered by gale force winds and pummelled by hailstones. Things have certainly changed over the last twenty years - none more so than in the area of working safely at height. Whether working from ladders or on roofs, best practice needs to be embraced by all those in the height industry so that, with training and safe working processes, risk of injury can be reduced for everyone. In the early 2000s some major organisations started attempting to ensure the safe lone working of their staff by introducing work at height training and basic standard equipment11 including ladder stabilisations, battery powered hammer drills and basic PPE such as hard hats and work boots, enabling them to evolve further and to be replicated and enhanced by other organisations. Developments in equipment and techniques for climbing and potholing during the 1970s led to new, faster and lighter ways of moving around in vertical environments.16 These sporting developments were adopted for use in the workplace after appropriate modifications and development of the techniques, including the addition of extra safety measures. This method of work became known as rope access. It has taken the last decade for rope access to become generally accepted as a valid way to work at height. Initial reservations were fuelled by a perceived danger of workers dangling from insubstantial ropes and by the employment of cavers and climbers without specific industrial training. The approach adopted by the UK’s Industrial Rope Access Trade Association (IRATA) may be summed up as the integration of rigorous work procedures and operator training. This, coupled with a growing statistical record of safe work, has led to a gradual reassessment of rope access in the workplace. It enables workers undertaking temporary work to access difficult places quickly and relatively cheaply, and to undertake inspections and a wide range of stabilising and other works. In addition to rope access, the versatility of the new methods and equipment has influenced the techniques used for many other applications, including use by arboriculturalists, steeplejacks and theatre riggers. Like any work system, the rope access work system must be inspected at regular intervals so that any problems can be eliminated. To make all the equipment used in work at height intrinsically fool proof would be to make work methods impractically slow, cumbersome and expensive, which would inhibit innovation and development. As a result, all the equipment is open to misuse, making proper training vital. With the right training, work situations that are perceived as potentially dangerous can be tackled with minimal risk. In recent decades progress in design has brought about a great variety of access equipment for work at height, including the use of safety nets, harnesses, scaffolds and platforms. 1. Self erecting towers are collapsible flat pack tower systems that can be erected from ground level, with three set working heights up to four metres. 2. Telescoping access towers offer another way to access work at height. This is a collapsible, telescopic scaffold tower and is available in aluminium or glass reinforced plastic (GRP). This tower has seven heights up to a working height of four metres. 3. Smaller powered access equipment is usually manually manoeuvred into the work position with powered vertical operation. Most platforms are partially user assembled. They are transported in three parts (base, mast and cage) and put together in situ. They are unsuitable for use on soft or uneven ground. 4. Trailer-based access towers are manually operated telescoping towers, in which the tower is integrated into the trailer for transport. They have a reasonable level of adjustment on outriggers and therefore a greater tolerance for use on uneven ground. The platforms are winched into position from ground level. 5. Scissor based access towers are also manually operated and have a similar base arrangement to scaffold towers. 6. Enhanced steps are similar to steps and ladders, but incorporate small working platforms. The height adjustment is likely to be limited, which will severely impact on the versatility of the product. 7. Podium steps are a low height folding platforms with steps. Different to adjustable steps, podium steps are an adjustable step ladder with a caged working position and outriggers. 8. Proprietary roof access systems use a leaning platforms system, which is based on both ladder and scaffold tower principles. This system is available in a number of different configurations that are suitable for different types of work activity. 9. Lifeline systems require a permanent or semi permanent installation, the issue being the strength and availability of anchorages. 10. Ladder restraint and fall arrest systems provide additional protection to users of conventional ladders. This system may consist of several separate components such as a harness, lifeline, ladder restraint, strap and wall anchor belt. 11. Scissor and boom type platforms also enable work at height access. There is a simple hierarchy for managing and selecting equipment for work at height. It follows the risk assessments that have been carried out for work at height activities and ensures all work at height is planned, organised and carried out by competent persons. An overhaul of guidance on working at height was launched in January 20143 as part of the government’s long term economic plan to abolish or improve out-dated, burdensome and over-complicated regulations. The HSE has now overhauled its guidance for such activity, setting out in clear and simple terms what to do and what not to do, as well as debunking common myths that can confuse and mislead employers.